Tonight I receive my gift…Michael is cooking dinner. I don’t think he realizes what a gift it is though. And no, he is not cooking omelets, pancakes or french toast. I gave him my Sloppy Joe Mac ‘n Cheese recipe and he is actually cooking. Meat. Noodles. Chopping onions. But, for now, I will hide in the office as he stands at the stove and write to you about these delicious meringue treats. I found this recipe in one of my many Pampered Chef cookbooks. There are so many flavor options available. For these I made them strawberry flavored, but you could do many flavors (as you will use Jello to give it flavor). At Christmas I make them wreath shaped and add in peppermint extract (skipping the Jello). Yum. Beat egg whites on high speed until foamy for about 30 seconds. Add cornstarch and vinegar, beat until soft peaks form (about one minute). While beating, add in sugar, in a steady stream. Depending on what flavor you want to use, you can add in Strawberry Jello mix (about 1 1/2 tsp of sugar free Jello). OR, if you want a peppermint flavored meringue, add extract and food coloring and skip the Jello. Beat on high for about 4 minutes more, until stiff peaks form. Using a cookie sheet with parchment paper, draw the shape you want to make using a pencil. Turn parchment over. Fill a decorator bag and use the large star tip. Pipe meringue onto parchment tracing your outline. 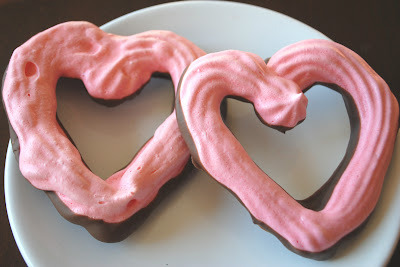 I used a heart shaped cookie cutter, but you could use any shape. Bake in a 200 degree oven for one hour and thirty minutes. Turn oven off and leave meringues in oven for another hour or more until completely dry. Melt chocolate chips until smooth. Dip bottom of cookies in chocolate, let dry on parchment paper. Store in airtight container for up to 7 days, enjoy!!! I love meringue cookies! You’re so right, the flavors (and shapes) possibilities are endless! I’ve been making a batch of different flavor and shapes meringue cookies every week. They are a hit in my family (and neighbors). Come check out my blog to see what I made if you are interested. Happy Valentine’s Day to you. Looks great! Love the heart shape. Thanks for linking up with Sweet Tooth Friday. Please share the love and link back in your post. Thanks!